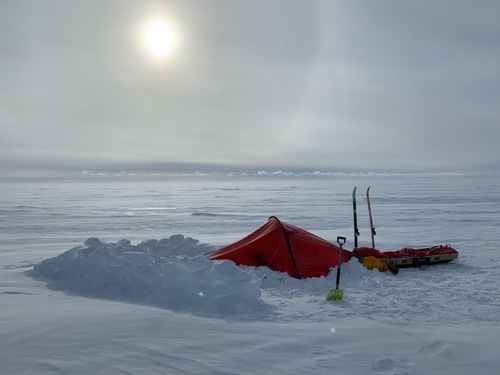 I'm in it now and as much as my mind has been denying the fact, I am slowly beginning to accept my self imposed fate (the exact opposite definition of fate of course) of a rigorous life in Antarctica. It's not easy here and the weather hasn't given me any breaks. This afternoon was the first time in a long time where I could actually see. Which is a bit sad actually because I skied by the most visually stunning part of the Hercules route, the Patriot Hills, a line of rugged peaks running South from the edge of the continent. I did manage a glimpse at the "three sails" three Nunataks peaking out of the ice cap a little past the Patriot Hills. Consistent with the weather pattern, my view was fleeting before blowing snow obscured my view of pretty much anything but the gray sky. I did see the round disc of the sun poke through the clouds for most of the afternoon. I'm not exactly sure the terrain I skied over today although I believe I was climbing for a significant part of the day. I also was surprised at the sastrugi, elongated snow drifts caused by the wind. Definitely a bit more drifting than I remember from some of my previous expeditions. Anyway, I got most of my emotional release out today. I was listening to podcasts of This American Life and there was one episode about a mother and son separated by ICE and another about a navy seal who committed suicide that were just gut wrenching and I sobbed uncontrollably in my goggles. With no other stimulus, it is almost impossible to think about the scenarios in great depth. Of course, I can't help but think about my own family as well.